mysterious Persian! Persians were smuggled along with spices and jewels out of Persia and considered contraband. Is it any wonder why these felines love to be pampered? Surrounded by exotic spices, food, and jewels? 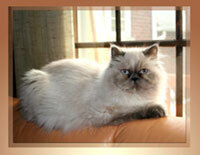 #2) In North America, Persians are considered the most popular breed. They are indeed my second favorite, second only to the Exotic Short hair breed--, which is basically a short haired Persian! People think they are in ownership of a beautiful cat, but in reality, they are in fact the one(s) being owned. Remember it is reported that Persians are descended from royalty. #3) Persians have sweet personalities, although every once in a while, a true alpha prima donna will emerge who thinks all other beings on this earth are there to please her (and on the even more rare occasion -him.) Persians are not, in general lap cats. They are more sit -beside -their- person- on- the -couch cats. 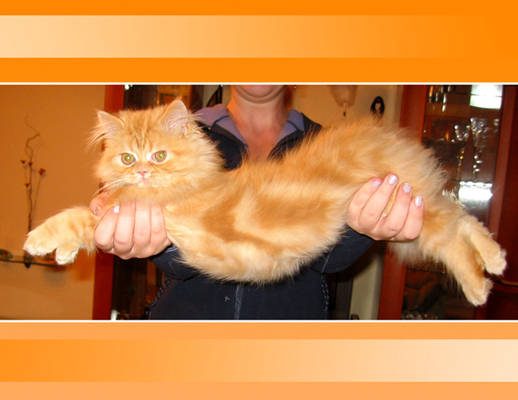 #4) Persians have petite but solid boned legs to support their wide diminutive bodies. Liking their feet firmly planted on the ground makes for Persians to be more on the ground cats than that of the Siamese breed-- climbers and jumpers. Unless jumping or climbing is required to reach you, a friend, seek out trouble, or their favorite resting place, Persians will not typically seek higher ground. They do not have survival instincts therefore; these purr angels are not meant to be outside cats. #5) Persians come in an amazing array of colors, divided into seven color divisions for purposes of competition in the American Cat Fanciers Association. These colors are solid colors, silver and golden colors, shaded and smoke colors, tabby colors, parti- colors, bi-color, and Himalayan. #6) A Persian, under the care of a trusted personal vet married with good nutrition and care, can live with their family for an average of fifteen to twenty years! #7) Persians that are show quality have long (sometimes overly so- high maintenance grooming is necessary for these babies!) thick coats, stout legs, a broad head with the ears set far apart. They are petite in size, with large round eyes, and a flat face. In other words, they have little to no nose! 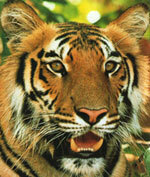 The more round-headed and flat face a Persian is, the more at risk they are to sinus and upper respiratory problems. #8) A little known fact about these angelic purr babies is that due to having such flat faces, their teeth deteriorates at a much faster rate than teeth of other breeds. Dental examinations are more of a yearly exam as opposed to when a cat reaches senior status (any time after age 7). #10) There are three faces of a Persian cat. The show quality face has the extreme face with little to no break in the nose. (The very flat faced Persians.) The breeder quality face, also known as a doll face, has a bit more of a nose and still has a rounded head. Their ears are typically a smidgen bigger than that of a show quality face. The pet quality can have a more typical cat nose, with a slightly angular face. The eyes can even be somewhat angular as well. Have you had friends tell you that cats aren't smart, or can't do tricks? Ha! It's time to put them in their place and show just how talented little Fluffy really is. Here's a simple-to-learn trick that should help show the doubters what's what. Get a simple embroidery hoop and something to use for motivation, such as treats, some canned food, or a few morsels of dry food. In order for this to work, your cat has to be hungry (not starving), so don't attempt a training session after a big meal. Hold the embroidery hoop on the ground in front of your cat with one hand. With the other, hold a food-reward just on the other side of the hoop. When I was training my cats, I used a food-reward they found completely irresistible -- canned food. I put a tiny bit on the edge of a spoon. The benefit of the canned food is its delicious aroma. If your cat is on a special diet, use a portion of his prescription food as the reward. Give your cat a verbal cue. It can be anything, as long as you're consistent. For my cats, I used the word "hoop." Use the cat's name as well when giving a verbal cue. When your cat walks through the hoop, reward him with a little food. Once your cat gets the knack of the trick, you can raise the hoop a tiny bit in subsequent sessions so that it eventually becomes a jumping trick. Always remember to reward your cat afterward. It's also important to keep the training session fun -- so never command him to perform, or reprimand if he doesn't do well. If you clicker-train your dog, you can use the clicker with your cat as well. When the cat goes through the hoop, click and reward. You’ve done your best to create a warm and comfortable environment for your cat, but there may be one element that could use some tweaking. We live in a horizontal world -- but our cats live in a vertical one. They use high, mid, and low levels of the environment for many purposes. In a multi-cat environment, being the cat who can claim the highest perch may help show other felines just who has the higher status. This can help keep peace. A cat can jump approximately five times her height, so she was born to take advantage of vertical opportunities. Your cat loves to climb and has incredible balance, so why not create cat-friendly vertical areas to keep her away from those off-limits locations such as your kitchen counter or living room bookcase? Elevated areas are also important in the cat’s environment because it provides her with a visual advantage. She has more warning time to see if an opponent is approaching. Mid and low levels are important as well for cats who don’t feel as confident taking the highest elevations. The more cats you have, the more levels you need. By increasing the vertical space in your home, you actually double or triple the size of your cat’s territory without literally increasing the size of your home. As you look around your cat’s environment, I’m sure you’ll find some ways to increase vertical space in a way that will create added comfort and security for your cat and still fit in with your decor. You don’t have to spend lots of money to increase vertical space. What matters most to your cat will be location, stability, and comfort. Despite their popularity, myths about cats persist. Separating fact from fiction provides a greater understanding of how to meet their special needs. When a cat falls a short distance, it often twists itself around to right itself and land on its feet. However, falls from heights can cause severe injury or death. A window without a screen or with an insecurely fastened screen is a life-threatening hazard. Other accidents happen when an air conditioner is removed from the window for cleaning or repair. Balconies are also a danger. A cat may fall from a balcony rail as it chases an insect. Securely fastened screens and being alert to other high-rise dangers help prevent serious injuries resulting from falls. This myth probably started as the result of a cat’s flexible skeleton that allows squeezing and twisting to negotiate narrow and awkward places. The factors that influence a cat’s longevity are proper diet and care, including regular visits to the veterinarian, and the cat’s genetic makeup. The average life span for a neutered cat who is housed inside is estimated to be from 12 to 14 years. The maximum life span is said to be 35 years. 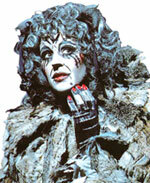 The roaming cat’s life expectancy is usually less than that of a cat housed indoors. This may relate to a more stressful lifestyle as the results of accidents, fighting and exposure to weather extremes. Cats cannot see in total darkness, but they can see much better at night with minimum light than humans can. Their vision in dim light is very sensitive. Protecting a cat’s vision is one of the reasons a cat should never be fed dog food. Unlike dogs, cats cannot manufacture the amino acid taurine. 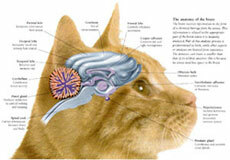 Lack of taurine in the cat’s diet can cause vision problems. Cats require a higher level of protein in their diet than dogs. There is no particular food that all cats like. This is why cat foods are available in a variety of flavors and textures. 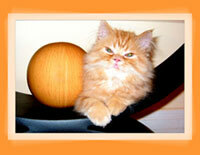 Once you find nutritionally complete and balanced cat food your cat enjoys, stay with it. Frequent diet changes may create a finicky eater and cause digestive upsets. Be certain the package label states that the product has undergone feeding trials in accordance with the Association of American Feed Control officials (AAFCO) protocol. Although neutered cats may become obese, this condition can be prevented. If the cat begins to gain weight, eliminate food from the table and, if necessary, reduce the amount of cat food offered. Cats can be encouraged to exercise through play. If there are questions about a cat’s body condition, a veterinarian should be consulted. Spaying and neutering have many benefits. Spaying a female cat before her first heat cycle can help prevent mammary tumors and uterine infections.